Good morning Gamecock Girls! It's day two of our fabulous Jack Rogers giveaway! 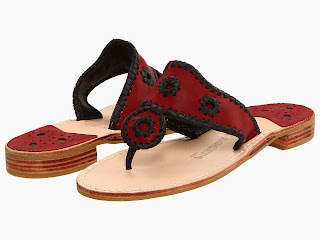 Jack Rogers is offering one very lucky Gamecock Girl her very own pair of garnet and black colored Jack Rogers Navajo sandals. As we countdown to the Homecoming game vs. Mississippi State this weekend, we will be posting a new blog post each day with new oppotunities for you to get entries in the Jack Rogers giveaway. You can still enter with Monday's entries, so if you haven't already, make sure you visit yesterday's post and get in your Monday entries. Deadline for all entries will be 12:00AM EST, Saturday, Nov. 2. Each day's entries will be compiled and a winner will be chosen at random. The winner will be contacted early next week by email. The winner will have 72 hours to reply to the email or a new winner will be selected. Jack Rogers shoes are a staple for any girl's wardrobe - young or old. You can never have enough pairs of Jack Rogers in your closet -- there are so many to choose from! Good luck ladies and get those tweets going!